Omegle is a good web-based chat site which you can talk with strangers. You can meet with many people there and you can have new friends from site. However some times you can’t connect to server on the site. We are going to give you some tips here about fixing that problem. Hope, it will be useful for you and you will able to talk with people again. However sometimes service can be down and you can’t get any respond from the service. There’s nothing to do against that. You can understand if site is down with help of some proxy sites. You can click here to see best proxy sites for the site. Pick one of these site names and Google it. Connect to site and follow instructions which we have told you in that page. You can’t also use the site if you are get banned from site. Be sure that you haven’t banned from site. If you are using Android or iPhone, please click here. There are also some technical errors on the site. May be you can not get into server because of that too. You can find enough information about technical errors in How to Chat Online. There are many and complicated reasons of technical errors. You will able to find good information about connection problem on Omegle. We hope that you will able to fix the problem with help of us. Omegle Doesn’t Connect to Server, How to Fix? Clear cache of the browser that you want to contact to Omegle. You should use Internet Explorer or Google Chrome for your browser. Otherwise this service is not going to work for you. 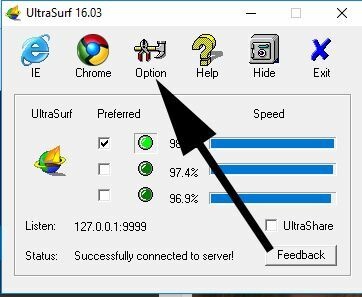 Ultrasurf VPN is only available for Chrome and Explorer browsers. Go to main page of ultrasurf.us and download the portable program. Please unzip the ultrasurf file.. There is only one file of the program, you won’t need to install it since it is portable. Run Ultrasurf..
Now we need to make a few settings to find a good VPN connection. Click on Option. There is a section as “Local Listening Port (26-65535) on the program. Please change the default number on it. You can assign any number that you wish between 26 and 65535. If your connection problem is not resolved, you will need to change this port number until you connect to Omegle. If you couldn’t connect to site with the ways which we have told you below, you can download free VPN service for Google Chrome which is called Hola. Click here to download the extension for your browser and the take a look at our video to learn how to use extension on Omegle. Have fun! You can also use our chat system alternatively! Video will be informative on usage of the extension. Let’s tell you how to use the extension. If you can’t connect to server or if you seem banned, just change the country. If you get ban message, don’t worry. :D The VPN service already got ban not your network. Also See: I am still getting server connection error with Hola VPN, Why? It’s not very hard to fix it with other ways too. If you have more than one dedicated IP for your internet connection. Switch your internet connection to other IP. Clear cache of your browser. Restart to Browser. 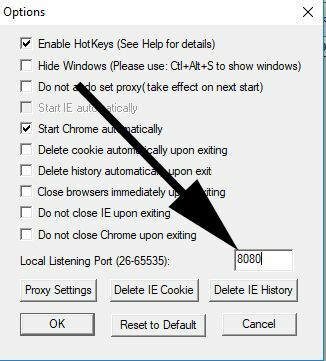 (Chrome, Mozilla Firefox) – We recommend CCleaner for clearing cookies. You can find it easily with Google it. After you clean registries, caches and cookies, we recommend you to restart your computer. Try change your browser. We recommend Google Chrome. Check firewalls of your network and computer. Also check your anti-virus settings and firewall settings. If you see something about Omegle on firewall settings, remove it or disable it. Restart your internet connection from your router if you don’t have a dedicated IP. Scan your computer with antivirus. Try join Omegle with VPN services. Still couldn’t connect to Omegle? Try alternatives! We also recommend Chatous for you to talk to strangers with video chat and text chat! Go to your application settings on your phone and clear all data from application (or browser). Then try reconnect to Omegle. If first step didn’t help you, then you should go to app settings again, clear all data from your Omegle application and uninstall it. Go to download page of Android or iOS and reinstall the app. Download a VPN application. You can search it on Google Play as “Hola Free VPN”. If you are still have same problem try contact to staff of the site or make a review on the related page of application of OS app stores. You can also try alternatives for iPhone or Android alternatives of Omegle Video. Good luck! One of these things will solve your problem. You will able to connect to site again. We hope that you are not going to have server problem again. This problem is really making me sick. I have using this website for years but I have never get server problem this much except there are really problems with the server. My friends can connect to Omegle now but I can’t do it. Since I am using dedicated IP for my internet connection, restarting the router doesn’t work. I am going to try Ultrasurf now. I hope it is going to work and I will able to connect to Omegle once more. Thank you for the feedback. Yes I have heard that someone from Moldova was unable to connect to server of Omegle recently. He managed to connect to the Omegle with VPN. You can also try it. I hope you are going to be successful. hi, i hope you can help me….. i used to go on omegle without a problem and all of a sudden this connection to serve occur and i dont know how, i alreayd reinstalled my browser even update my flash player but it’s still the same…. So what’s happening is this… when i clock video then click allow my camera open but then it’s gone and says connecting to server and even i click turn on video, it just wont turn on….. in short the video dont work…. my camera works fine………. Hello, is there any other way to fix this connection problem? Hello. I am from Norway. I am not sure my ISP is allowing me to enter to Omegle. I can’t enter to chat at all.